Blackjack is based on the popular card game 'pontoon' or '21' and this is a major gambling attraction at casinos, where you will always find a number of dedicated tables and experienced casino dealers. 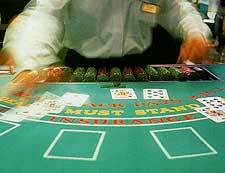 When playing blackjack at casinos, players do not rely on just luck, but are able to employ skill and strategies, often based on gambling experience. Players who master the skill of playing this game, whether gambling online using the Internet, or playing with a dealer in a casino, generally have a realistic chance of winning at the game of blackjack. The game is always played against an actual dealer, who plays on behalf of the casino itself. When playing blackjack, you are always trying to beat the dealers hand, without exceeding a total score of more than 21. The game is played with standard decks of 52 cards and often up to six separate decks are used in play, meaning that a total of 312 cards can be in play during any one time. The objective of the game of blackjack is to obtain a score closer to 21 than the dealer, without exceeding 21 (going 'bust'). If the player's cards exceed 21, they lose the game. Blackjack is amongst the most popular of all the casino games, since the rules are relatively easy to understand, and the game itself is enjoyable to play, particularly when you are surrounded by other players. The casino may operate their own variations of the rules, which can directly affect the actual 'house advantage', and so experienced players should familiarise themselves which any such rules, before planning their strategy.